I'm not a huge red meat eater. Most of the time, I am content eating pasta, chicken, veal, fish, grains, fresh fruit etc . . . As long as everything is farm fresh and organic, I don't need a ton of red meat in my died. But every so often, once or twice a month, I get a craving for red meat. I like my meat lean, fresh and organically raised, but yes, I do enjoy a meal centered around a nice cut of red meat every so often, whether it is steak, short ribs, brisket or braised stew beef like a beef bourguignon. I am disappointed when my bi-monthly red meat indulgence is not a good lean cut of meat, because there is nothing I detest more than excess fat. For last night's dish, I prepared boneless short ribs, which were a wonderful lean cut from Fresh Direct. I braised the short ribs in a braising solution that was pretty much a mixture of a full bodied red wine and chicken stock, with plenty of herbs and vegetables mixed in. I always add a small amount of tomato paste to my braises for flavor. I generally avoid adding more tomatoes than that though, otherwise the sauce is too heavy and overpowering. For tonight's dinner, I paired a full bodied wine to complement the red meat, the 2007 Cabernet Franc that I received from Wagner Vineyards, a Seneca Lake Winery which is well known as one of the top Riesling producers in the Finger Lakes , and in the United States as a whole. I've tried a lot of great Finger Lakes Rieslings, but not yet a Cabernet Franc. 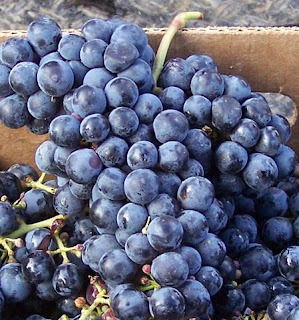 Cabernet Franc is similar to Cabernet Sauvignon, but buds and ripens a week or two earlier, which allows it to thrive in cooler climates like the Finger Lakes of New York, and Southern Ontario, as well as the Loire Valley (France). Wagner Vineyards' 2007 Cabernet Franc was quite delightful. It was a full-bodied wine that had hints of berries - mostly cherry and perhaps a bit of red currant. It wasn't too dry, but had just a bit of a burst of cherry and a pleasant aroma. I thought that it paired nicely with the red meat and the wine complement of the sauce. Heat half of the oil in a large Dutch Oven on medium high. Season the boneless short ribs with salt and pepper and dredge in flour or matzo meal. I used matzo meal so not to overtly break Passover (yet!, this holiday isn't lasting the full eight days for me though), but you would ordinarily just use flour. Sear 4-5 minutes on each side until fully browned. Set the meat aside on a plate. Using the same pot, add the vegetables and herbs. Add the remaining Canola Oil and brown the vegetables lightly for about 7-8 minutes. Then stir in three tablespoons of tomato paste. Add the wine, chicken stock and seared beef short ribs to the pot. Bring to a boil and then cover the pot and put it in an oven that has been preheated to 350 degrees. Braises the ribs for about two and a half hours in the oven. When you open the pot, they should be tender and fall apart when you cut them with your fork. You can serve with the sauce as is (we did and it was great) or you can reduce the sauce if you prefer a thicker sauce to accompany the meat. This is beautifully done and I love that it is versatile and adaptable for Pesach! Just wonderful! Hey Sasha, I'm just like that. Most of the time I can go vegetarian with just some fish from time to time, but sometimes I just do want something rich and hearty like these short ribs-looks wonderful by the way.